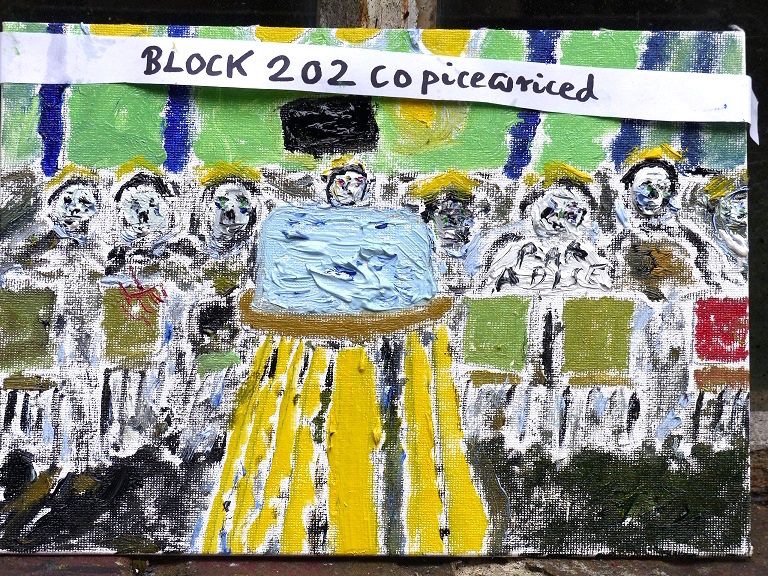 At the beginning of December last year, I received 10 e-mails and 22 JPEGs of paintings of blocks of ice from my speciality act chum The Iceman. His stage act involves melting blocks of ice. That is his entire act. I blogged about it. 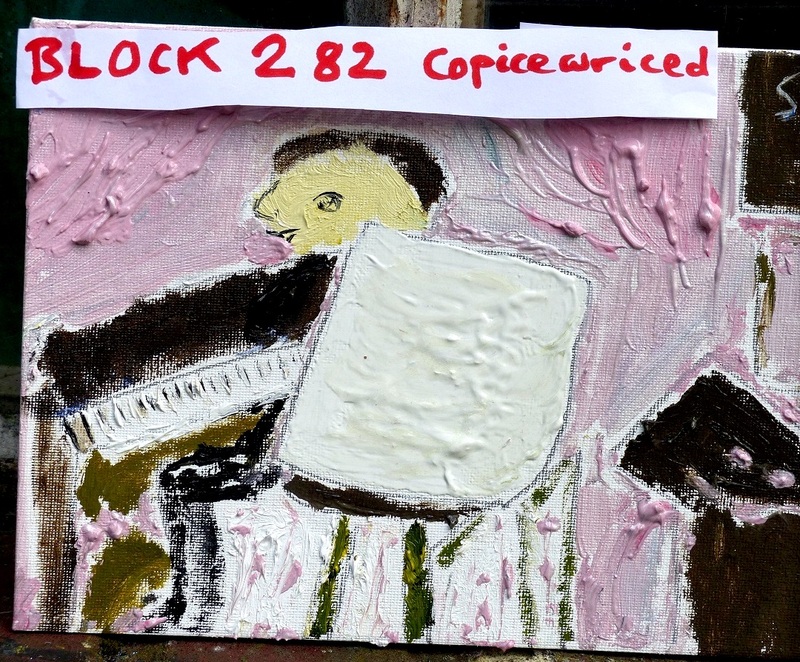 THE PAINTER FORMERLY KNOWN AS THE ICEMAN BREAKS/DOUBLES VINCENT VAN GOGH’S RECORD, SELLING 2 PAINTINGS IN HIS LIFETIME. Since then, we have had a chat about it. We met in the Topolski Gallery/Bar under Waterloo Bridge in London. “So you are at last being properly considered as a serious artist?” I asked. “Blocks of ice,” I said. “So are you not going to do live performances any more?” I asked. “Won’t that devalue your unit retail cost?” I asked. “All your paintings are based on photographs?” I asked. “Did you live in a tent or in a caravan?” I asked. “How long were you with the kangaroos?” I asked. “It’s not their area of expertise,” I suggested. “I suppose not,” said The Iceman. “Tell me more about the boxing kangaroo,” I prompted. “You did this job just for kicks?” I asked. “You never got kicked?” I asked. “You toured with this circus?” I asked. “Why were you working in this circus?” I asked. “You should paint kangaroos,” I suggested. “They are all blocks of ice,” I pointed out. “Quite a strong feeling of…?” I asked. “That could be it,” agreed The Iceman. “Let’s assume it is,” I suggested. 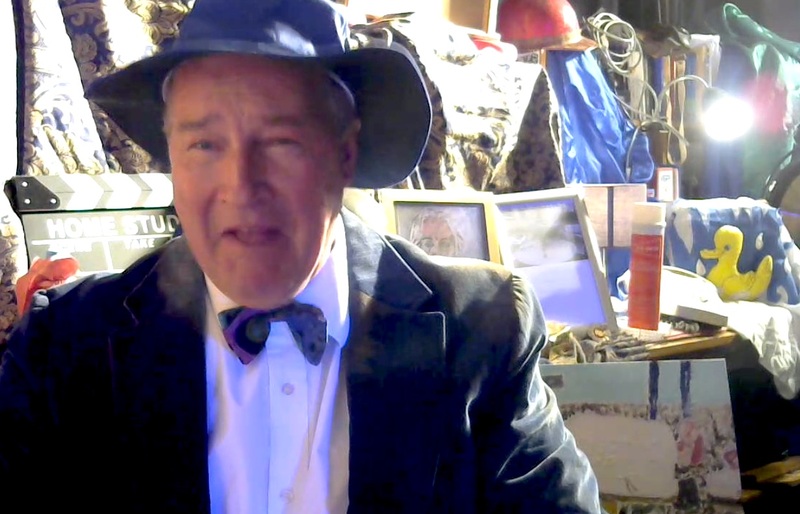 Via Skype, I talked to my chum the legendary – some might say semi-mythical – British alternative comedy / performance artist The Iceman. 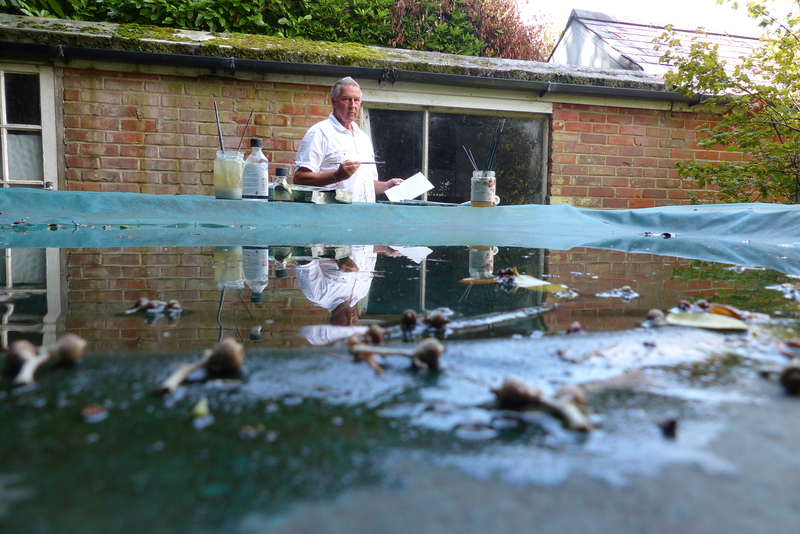 “You were kind enough to show some interest in my paintings,” he said. 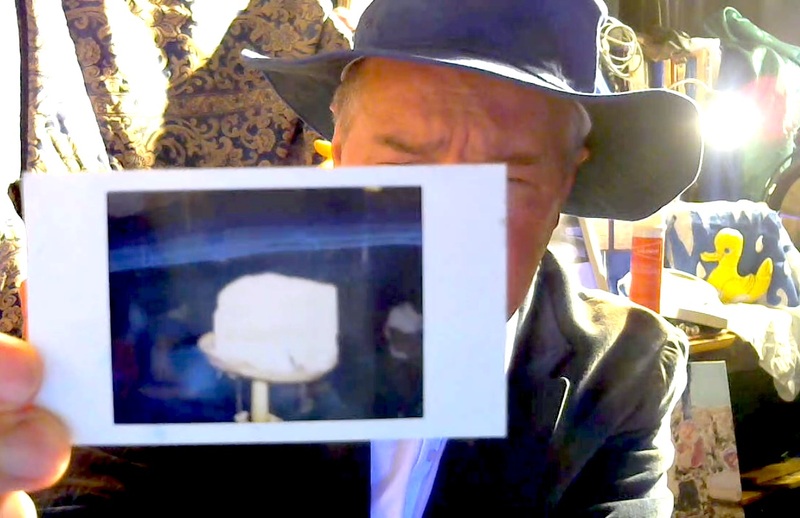 He has been melting and numbering blocks of ice on stage around the UK for at least 30 years. I first encountered him when I auditioned acts for The Last Resort With Jonathan Ross TV series in 1987. For almost that long, he has been taking Polaroid photographs of his blocks of ice and trying to sell signed faxes and photocopies of the Polaroids for surprising amounts of money. Now he has a new artistic idea. 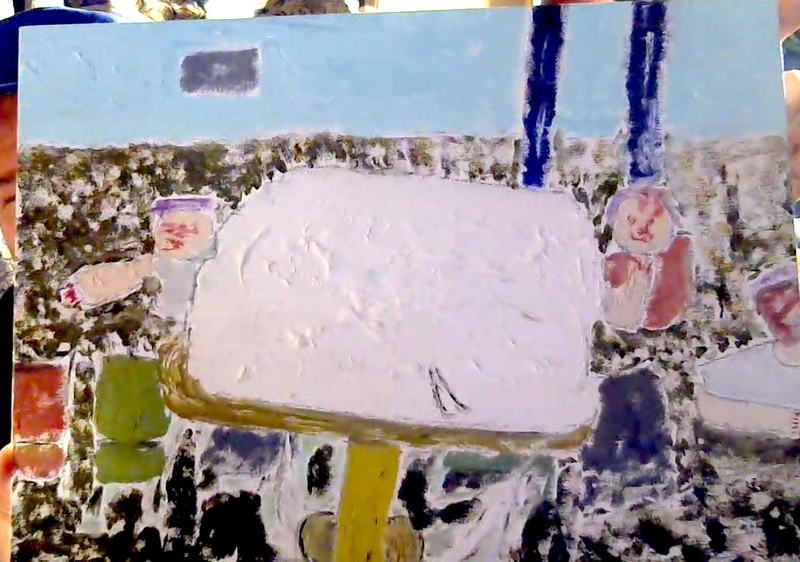 He has started to create oil paintings of the Polaroid photos of his blocks of ice. 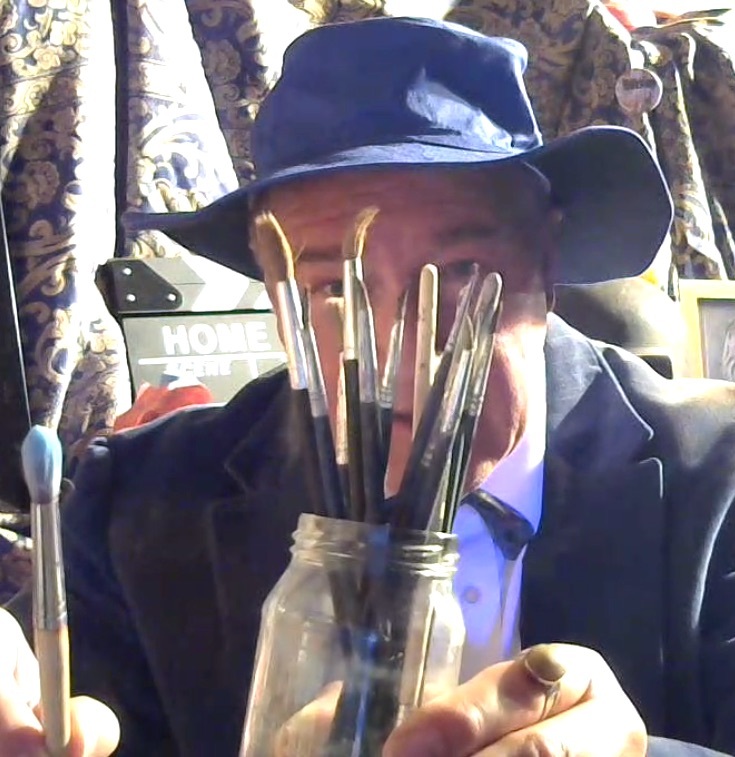 “Why have you decided to become a fine artist instead of a performance artist?” I asked. “Has the interview started?” asked The Iceman. “It is not for sale,” said The Iceman. “Did you hear about the probe landing on the comet full of ice?” asked The Iceman. “My hat,” said The Iceman. “With the bow tie?” I asked. “With Skype,” said The Iceman. “So why do paintings?” I asked. “Which is your favourite?” I asked. “All reliable?” asked The Iceman. 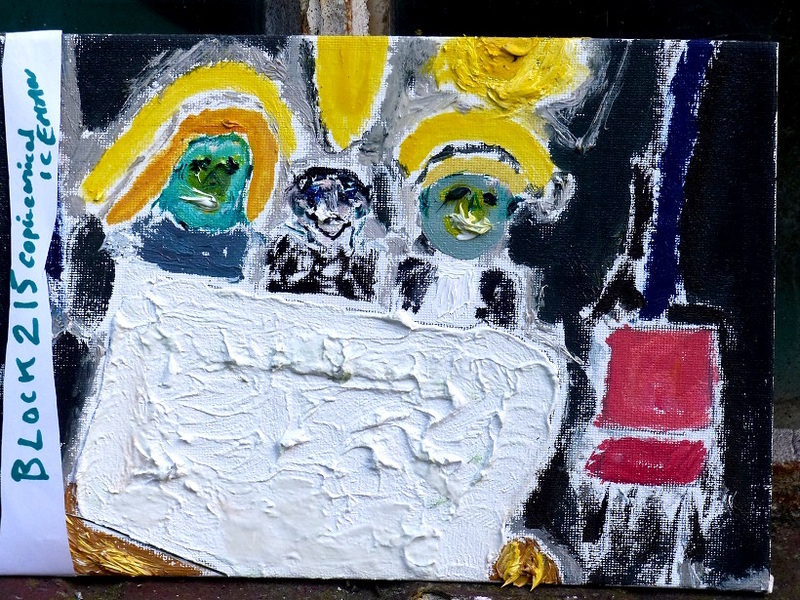 “All in oils?” I repeated. “But why paint them at all?” I asked. “I do not want to be pomp-ice,” said The Iceman, “but I think the point I am making is I am just interpreting these blocks in my own way and what I lack in technique and skill I like to think I make up with heart. So I think quite carefully before I paint and then I do it in quite a fast manner. “It is a bit like my original so-called act. I lacked technique and skill, but I think there was something that I was sharing with the publ-ice. I am hoping sometime soon to have a gallery situation where I have a sequence of Polaroids underneath the paintings. Or maybe above them. And, of course, I would be melting a block of ice in the gallery at the same time. So there would be all types of things happening at once. A live performance, wise sayings and the archive and the more recent interpretation of the archive. “Why did you call it Blue Block?” I asked. “My paintings,” replied The Iceman. “How many paintings have you sold so far?” I asked. “What sort of prices are we talking about?” I asked. How do street artists make money and who is this trendy DRB matchbox guy? 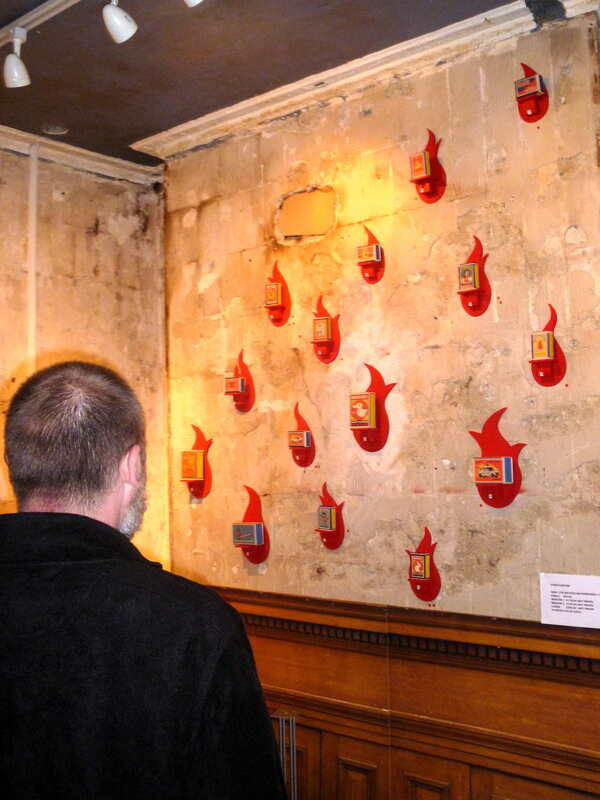 Yesterday, I went to the Ben Oakley Gallery in Greenwich, to see the last day of artist DRB’s exhibition Firestarter – basically matchboxes custom-made by DRB. 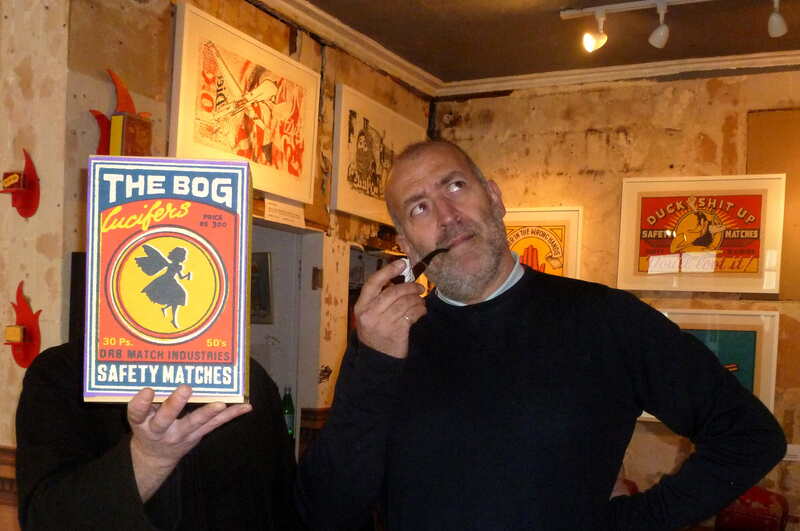 But we are not talking normal matchboxes here, we are talking Art. 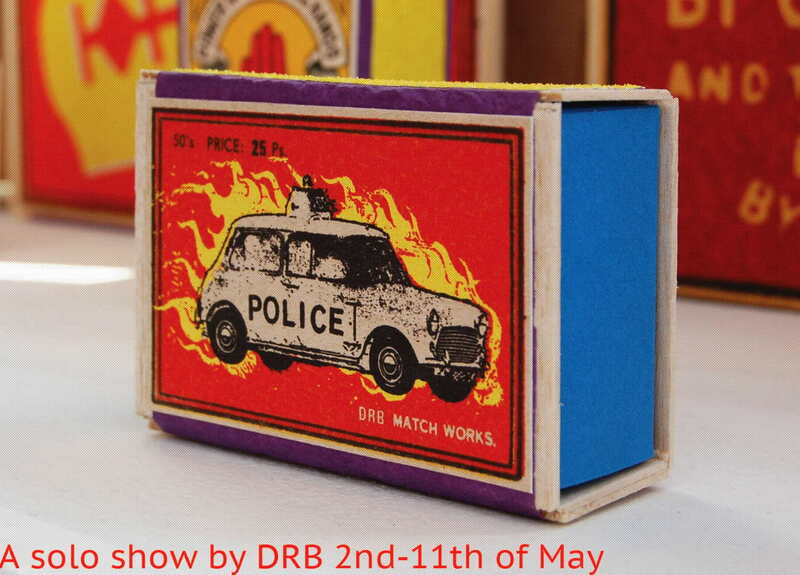 Some of DRB’s matchboxes are now in the Victoria & Albert Museum’s collection in London. 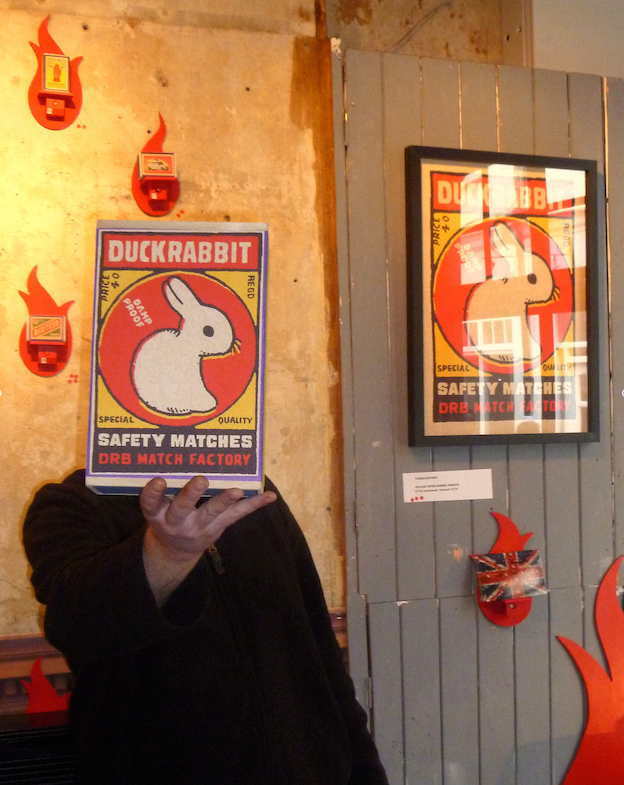 The boxes are being displayed at a gallery in Hong Kong in about a week and DRB has a duck with hands for ears which is in Boston in the US at a liquid arts venue. “And you do now?” I asked. “Though the world is different…” I prompted. 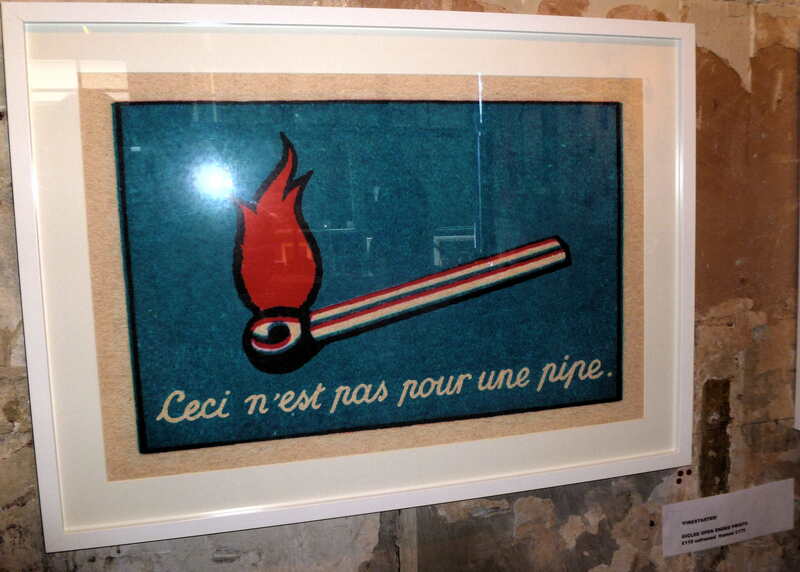 Ceci n’est pas un Magritte de Belge… C’est un DRB de Sarf Eest Londres. “How does that street art thing work?” I asked. “Do you do street art?” I asked. “I put things on the street,” DRB replied, “but that’s just me being playful. I’m not really a street artist, I’m a gallery artist. “So they maintain your artworks, but they don’t know you originated them?” I asked. “Are DRB the initials of your real name?” I asked. “Have you got a website?” I asked. “But you said you know how to design websites,” I said. I was at the Tate Britain art gallery this afternoon, which is obviously replacing the Groucho Club as the in-place to meet media types. On the steps outside, a BBC News crew was interviewing someone. Inside, a film crew was shooting footage for some Channel 4 arts programme. And, when my friend and I were looking at a Damien Hirst painting of spots, we got asked our opinions on modern art in general and Damien Hirst in particular by a reporter for the Mail on Sunday. He told me that, usually, he had to apologise for being a Mail reporter which doesn’t surprise me as the very name Daily Mail is like a blue rag to a left wing bull. Perverse, pseudo-intellectual liberal airheads with superiority complexes, that’s why. It’s simple, straight, uncomplicated and very nasty snobbery. In January this year, the Daily Mail’s average net daily circulation was 2,136,568. The Guardian’s circulation in the same period was 279,308. The Mail on Sunday’s average circulation? – 1,958,083. So why deride the Daily Mail and the Mail on Sunday? Because ordinary people read them. People who did not go to Oxbridge and do not live in Islington. The sort of ordinary people the Oxbridge Islington wankers look down on. The sort of ordinary people the Oxbridge Islington wankers make increasingly crass TV shows for. They wouldn’t be caught dead watching the TV programmes they make because they think they are better than that. And the ratings are falling for these entertainment shows. Britain’s Got Talent and The X Factor are made by people who understand popular culture. Increasingly, though, TV entertainment shows are made by people who don’t; they are made by people with superiority complexes and a contempt for their audiences. They are made by people who look down on Daily Mail readers as mental and cultural inferiors. But who is out of step with reality? Who is out of step with what the majority of people in this country think? From the circulation figures, people who write for and read the Guardian and the Independent.